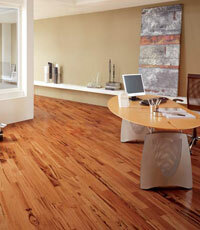 Tigerwood Hardwood Flooring gets its name from the orange color and grain patterns which makes it look like a tiger. 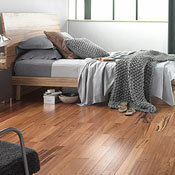 The tree this flooring is made from is called Astronium Fraxinifolium and comes from Latin America, particularly from Brazil, Paraguay, and Uruguay. 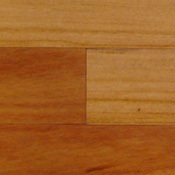 This type of wood flooring recieved an 1850 on the Janka Hardness Scale. Here we have some general guidelines about Tigerwood Hardwood Flooring. 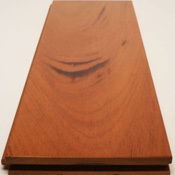 Tigerwood flooring is one of the easiest woods to polish in the world, but sanding requires some skill. You must be very careful when sanding because improper technique may result in permenant damage. Sawing is also a problem with Tigerwood. Most flooring experts recommend using carbide-tipped cutting tools in order save as much of the woods strength as possible. Tigerwood will hold nails very well, but pre-boring is highly recommended. 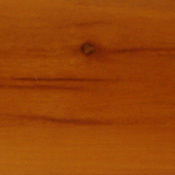 You must be careful with Tigerwood because if exposed to sunlight, it will change color. Do not be suprised if the floor in front of windows is a different color than the floor surrounding it. Tigerwood is an excellent wood flooring product despite the drawbacks, but you must remember to consider every aspect of the flooring before making a final desicion. Here at Owen Carpet we offer many Tigerwood products, as well as many other hardwood flooring products for you consideration. 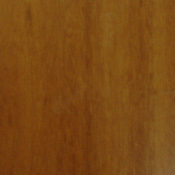 These are some Tigerwood Products we offer.